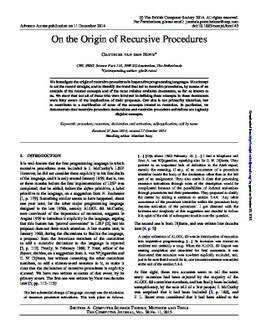 We investigate the origin of recursive procedures in imperative programming languages. We attempt to set the record straight, and to identify the trend that led to recursive procedures, by means of an analysis of the related concepts and of the most reliable available documents, as far as known to us. We show that not all of those who were involved in defining these concepts in these documents were fully aware of the implications of their proposals. Our aim is not primarily historical, but to contribute to a clarification of some of the concepts related to recursion. In particular, we demonstrate that recursive procedure declarations and recursive procedure activations are logically disjoint concepts.